Siblings are the best, mine helped me through tough times and we all love each other unconditionally. We still argue, but there's always love and support to be found. Thanks for sharing! I feel the same way about my three brothers. They used to tell me they wanted to exchange me for a goat, now we all get on. Your children sound so much like my two oldest. Though the years have taken them to different states--though each has kids and careers--they remain as close as ever. Thank you for lovely post! And for your commitment to a better world for all children. Thanks Walgreens and Shot@Life for helping make this happen! It is a relief to hear about children getting through their teens and doing well. Thank you, Frank. Thank you your reassurances. Ghana was indeed a wow, such a wonderful country & we have such amazing friends there. Thank you for this great blog celebrating your children. I have a newly minted thirteen year old and am feeling pulled in two directions too - missing the young, carefree girl who was happy to dive into anything family (Scrabble, anyone? ), and now figuring out our rolls and relationship as she spreads her wings and tests out new flight patterns. You describe Gisele and Leo's relationship so beautifully, and the picture of the two of them just squeezes my heart. What a team they make. I love getting to support Shot@Life's vaccine initiative by commenting here, and love your post. Thank you! New flight patters. That's it exactly. Good luck with your own girl, and thanks so much for commenting. Thank you for your sensitive, thoughtful post, especially your reflections regarding autism and vaccines. Time must be moving fast! Interesting to read about your point of view on vaccines. Thank you. You are right, I do feel like we're parenting at fast-forward speed sometimes. Thank you for reading. My 3rd and middle child is now 13 and I definitely agree that 13 can be a challenging and pivotal year. But having witnessed how my two older daughters came through it to be such charming, considerate and thoughtful young adults gives me hope and confidence that the younger three will each have their own 13 experiences, only to make them the strong and passionate adults that I'm certain they will be. At 13 Gisele may be concerned about her relationships and appearance more than you may have expected, but she can also travel with you to Ghana, see the inequities in this world and know enough to be grateful for the value of vaccines. Make no mistake about it. She is still learning from you, the ultimate role model. Thank you Shannon for being such a consistent supporter of vaccines for the many years that I have known you. Your guest post on our Shot of Prevention blog is still widely read today, 3 years after it originally posted. (http://shotofprevention.com/2010/10/04/why-my-child-with-autism-is-fully-vaccinated/) And thank you for making such a significant contribution to the Shot@Life campaign. Every Child By Two is so proud one of their partners and thrilled that they have also partnered with bloggers as caring as you for #Blogust13. Thank you, Christine, I have likewise always appreciated the work you do on behalf of our and all children's health. And thank you for the reassurances based on veteran parent experience -- so appreciated, and good luck with your not-yet-teens as well! I agree in the importance of siblings as mine has also been such a support to me. Despite our differences or perhaps because of these, we have been there for each other through some difficult times and difficult illnesses and have only gotten closer. I am glad that Leo and Gisela share such a loving bond too. This was a lovely post. I remember that age well and it was a time me and my brother didn't speak but have become close again. thanks for sharing. thanks for supporting shot@life and the united nations foundation. Love your description of Gisela and Leo's relationship, their similarities and differences. Thanks so much for supporting Shot@Life! What a beautiful post, filled with family love and universal love. Thank you for being a voice for vaccines and for your great support of Shot@Life. Thank you for the beautiful post. And thank you for standing up for vaccines and helping parents make informed decisions concerning immunizations and autism. Tried to comment/not sure it took so this one is to make sure!! Loved this post! Really interesting to hear how your views changed. Great post. Thirteen surely seems bittersweet. I know I practically destroyed my mother at thirteen (and fourteen and fifteen...). The only thing somewhat preparing me for that is knowing that, more than anyone (and that includes my husband, who I love very much), my mom is my best friend in the world now. (And she always has been, even when I didn't appreciate it at thirteen.) Good luck with the teen years. I just love how they are looking at each other in the photo. What love. Thanks for this post! And what a lovely idea to have vaccines given! A brave and beautiful post. 13 is a right of passage. What a wonderful, heartfelt story! Thanks Squidalicious! Let's give more kids a shot at life! Great post! Comments = 1 vaccine! What a great campaign! What a great post and a great cause. Thank you so much for sharing! Love this campaign. Make sure everybody to comment as much as possible! Thank you so much for sharing this! I love the relationship between your kids and thank you for sharing how your view changed on vaccines! (Ack - got cut off) ... and their obvious warmth and love for each other. Those are the moments we're doing this for! This is an amazing, personal story thank you so much for this glimpse into your world and an opportunity to help. Beautiful story about your children. The importance of vaccines is certainly becoming a more discussed issue within schools. It is with hope that Shot@Life can lead the way to a better life for many children where vaccines are challenging to get. I feel that they have opened many doors already-I hope that they continue to reach out to those in need. Thanks for sharing your children. And for your support of vaccination. And for your account of recanting your earlier stance. Thank you for sharing your change of opinion about vaccines and autism. The evidence does not support a link between them and more parents need to be educated about the current research. 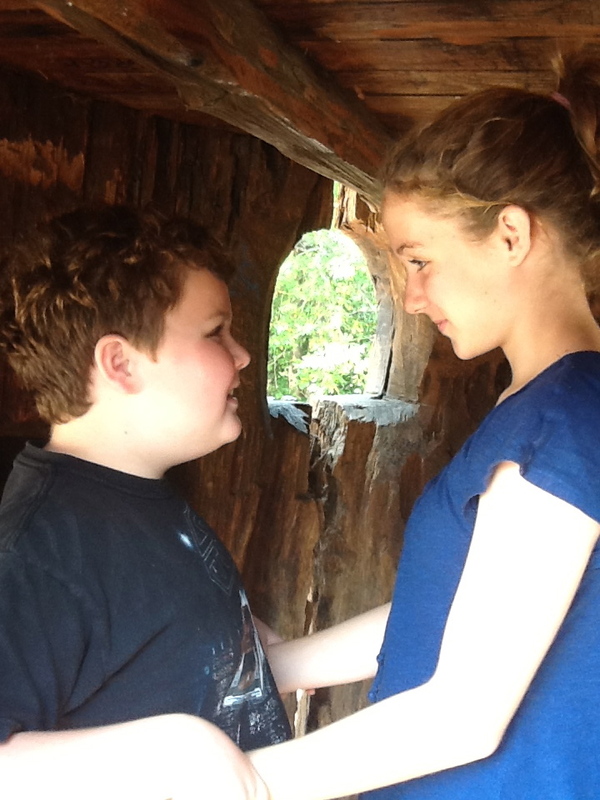 How wonderful that your 13 year old is such a support and great sibling for her brother with autism. It is wonderful that you and Gisela got the chance to visit Ghana and to immerse yourselves in a culture of those in need. I am sure that your children will have a better appreciation for their privileges of being vaccinated. It gives me great pleasure knowing that you have changed your opinion in linking autism and vaccines. it's great to see such an intimate relationship between your son and daughter. that's incredible that she has the ability to help him calm down when it's not possible to self-soothe. it's also great to see a parent who does not blame vaccines for their child's autism. you are so informed, and it's incredible. keep spreading your experience so others will continue to know the importance of vaccination! What a wonderful reminder of the perspective of children- and the kindness and love shared between your children. Thanks for sharing as part of Blogust! What a beautiful post. Thank you for sharing your family with us. My daughter is six. I cannot even begin to think of 13, and yet ... sometimes I blink and see it! No one has said it yet, so WOOT! Great read Shannon! My oldest is 14 and the twins just turned 12 so I feel your pain! I will never stop the hugs and I love you's either and do it every chance I get! Thanks for your blog post! My sister is a senior in high school and it is so scary that my little sis is growing up! Great post and thanks particularly for sharing your rethinking about vaccines and autism. Today my child shouted: I am DONE with being nine! I want to be a teenager! Appreciate you denouncing the purported link between autism and vaccines. Andrew Wakefield has done a great disservice! We need more voices like yours and your daughter's to help get vaccines to all children. Thank you for your post and for your good work. I've been really thinking about this lately. My oldest is almost 20, so I experienced 13 and the drive to be independent, although this happened for me on a greater scale when she turned 16. My son is a preteen and I'm so worried about what Jr High and High will do to him. He has a mild learning disability and I want him to be happy and secure. I'm so glad all my children are healthy and live in a country that provides vaccines. Thanks for the post. You are right it is so bitter sweet. I'm tearing up as I think about it. It's wonderful to read that all three of you get along quite well. Family means a lot. What a beautiful story! Thanks so much! Thank you for sharing your story and supporting this initiative. It sounds like you have 2 beautiful, wonderful children who are very lucky to have a mother like you. So beautifully written... truly from the heart. What lucky kids to have such an insightful mom! Sounds like you're handling the beginning of teendom pretty fabulously!!! Thank you for sharing such intimate and heartfelt information about your feelings and your children. We also greatly appreciate how you have acknowledged your mistaken views about vaccines and are now working towards getting more children vaccinated. You are to be commended on all fronts. We too are barreling toward 13 with our ASD boy, though his older sister (who fights with him something awful...but is taking AP Psychology this year in high school on her self-professed path to becoming an OT or psychologist who works with autistic kids) is quite a bit past that age. (Sob.) Lovely post! Oh those were the days! Thanks for supporting this fantastic cause! I want to help kids everywhere get what they need! Health, opportunity and choices!!! Lucky kids, lucky mom! A lovely post. What a gorgeous meditation on your children's relationship(s), insights, gifts to each other, and impact on each other and you. Thank you for the window into it. Also thank you for your candid testimony about your own evolving position on pseudoscientific "links" between autism and vaccines. And especially, thank you for sharing your daughter's awareness. That "Gisela's good fortune in being fully vaccinated was not lost on her" ensures that it is not lost on us. A smile from a fellow astounded mother of teens. Lovely ruminations, great writing, and another fantastic cause. Thanks for taking it up. Cannot wait to hear about Ghana. We are on vacation this week with lots of backseat bickering, so this perspective came in extra-handy. Thanks, as always, for your amazing writing and ever-inspiring honesty. Thank you for your beautiful story of your children! And thank you Walgreens for all you're doing to help! Longtime fan of Leo & his family, especially his take-no-prisoners mother. Woot! Congratulations for this article. Wish all the best to all! I started reading without the explicit understanding that should've been implied, that there would be tears. Thank you for sharing. I think the tears came when I read about how pushing you away aches. Mine is 3 and I am already not looking forward to those days. Thank you Walgreens! Vaccines are valuable additions to our international development toolboxes and I love being able to do something simple to help someone else's survival. My nephew has autism and he's 20 and lovin' life :o) Thanks for helping vaccinate! Sad, but so common I think every parent looks for something/someone to blame for inexplicable problems that befall ther children. Vaccines save lives. It's just that simple. Lovely post and so nice she has a brother who always keep her from getting too serious about herself and love her regardless. Excellent way of getting vaccines out there. Yes, we must become more science literate. Preventing your child from getting vaccines for horrible deadly diseases is a misstep, when millions of children are not vaccinated. Thank you very much for your lovely words. And thank you for helping vaccinate children! I hear you on thirteen! And happy to comment to donate a vaccine. Will share as well on my pages. Great article and bravo to Walgreen's for donating vaccines! Thank you so much for sharing this--and contributing to such an important effort. More than 100 children vaccinated so far, whoo! What a wonderful blog and cause! Nice article, thank you. Interesting to learn about Ghana. Great. love all the UN Foundation campaigns. Let's get more comments! Great description of challenges of teen years both for teenager and parents. Sounds like Gisela has a good heart. Appreciated your comments regarding autism and vaccination issue. Thanks so much for sharing this wonderful post for a great cause! That is truly a lovely story about your family. I am so glad they are close and have each other. I tell my two girls when they're grown, and Mom, Dad and Grandma are gone, they'll still have each other. To love one another and build a foundation now for an indestructible relationship later. What a nice blog about Gisela reaching her teenage years. I remember those with my daughter. Thirteen is a great number! I loved reading about your son & daughter! The teenage phase won't last too long..I'm 25 and decided to live with my mom again! :) All the best to your family! You write very well - all three of your children are blessed to have a Mother who loves them with such intelligence. I barely remember turning 13, however i do remember the stages of waiting to be double digits, 10; teenager,13; driving 16, legal 18, drinking 21...now i am 25 and no longer want to push the years. time goes to quick! So so true. We have two hurtling towards thirteen in this house. Great post, great cause. I love this age. I Love their take on the world and how they're forming their own opinions. Feeling very hopeful for the future! Someday you may look back on this phase as the best time with your kids. Thanks for sharing! 13teen is bittersweet and cool: a new step in your familylife! As many a mother who dealt with the 13 and + years, I now have the friend and daughter that is the best - she is a great mom and we talk of those days when we both wondered if we'd survive the growing process. I wouldn't change it. As a mother, my daughter debated the issues of vaccines. She worked out her issues and knows the importance of having the vaccines. 13!! Wow. I love reading about each age. It all seems so far away. Thanks for this insightful post! What a nice way to see. Thank you for all the work you've done on educating parents that autism is not caused by vaccines. And thank you for participating in this campaign. Lovely post. My son is still a few years from teenhood, but I am feeling all of those things too...seems like he is growing up so fast. Thanks for your effort toward the vaccine program. "While Gisela will now debate with me outright about choices and chores, Leo -- who reserves the right not to speak unless it really matters -- will merely give me a sidelong glance to let me know that he heard me but has no intention of complying, then take off in the opposite direction." It's all true. I'm a witness. this is important and valuable. and sweet. my 13 year old is too cool for school. at least until Thursday. I have a 13-year-old of my own, as of three weeks ago. Though I'm not sure I ever considered her obedient. Good post, and good cause. bless you and your darlings! You are an amazing mom, everyone should have a mom like you! Gisela is so lucky! Ahhhh—13. Such a lovely age. And you've got TWO! More power to you, sister. Thank you for sharing your babies with us, and for doing it around such an incredible cause. Just realized how long ago 13 was for me and how close it is for my son! AH! Thanks for sharing your story! It's really great that you're participating in the Blogust event. Keep up the good parenting! This is very lovely; thank you very much for sharing. I enjoyed being a teenager as well. I still got that special attention from my parents but with some more freedom to do things on my own. What a great post, thank you for sharing!! Shot@Life!! Thank you for a wonderful post and thank you Walgreens for helping to save lives with your generous donations of vaccines. I want to be counted. I am so glad to read your perspective! Thank heavens for informed perspectives! Oh my how Gisela has grown. For my own Jumper Girl, the 12th year was much more stormy -- but now she is twice twelve, and I am shocked to reflect that she will hit the quarter-century mark in a few short months. And yes, the relationship between Gisela and Leo is a beautiful sight. Thanks for sharing your family, and thanks to all who are participating in #Blogust 13. Especial thanks to Walgreens. enjoyed hearing your story. good luck with the teen years! Lovely post and sentiments. I like how you are using the blogosphere for activism. Awww...It's really cute how they are siblings yet sweetest companion of each other. Lovely. That's how it should for all siblings. 13 was bittersweet. No longer a child, like you said, but also you don't know what the future holds. Such a beautiful story about your kids. Thanks for sharing... and thanks for supporting Shot@Life! Teenagers will always need (and appreciate) a listening ear and a hug. Thanks for sharing this special bond between your son and daughter. Like you my son with autism will be thirteen in a few months. I've had two older sons reach that milestone, but my youngest's transition to adolescence will be the most bittersweet. Like you I am also passionately pro-vaccine. A beautiful sharing.God bless your family especially your two cut children. Heartfelt thanks to you to giving us opportunity to be with the noble initiative of Shot@Life to stop the spread of vaccine-preventable diseases. Thanks for sharing Gisela with us, and your feelings about all the children. 13 is a turning point. Great post. Wonderful post! Thanks so much for supporting such a great cause! I've been a fellow champion with Shot@Life since the beginning and am proud to continue my work to give every child a chance at a healthy life! Thank you for taking the time to be involved in Shot@Life, and for giving us the opportunity to do even a little bit.